I'm taking a little break from reading today. Actually, I've been taking a lot of breaks from reading lately, but that's another story. Today, our family will be doing an early dinner at my parents' house. I'll be bringing homemade cranberry sauce, sweet potatoes, cranberry bread, pumpkin chocolate chip muffins (egg and dairy-free!) and Pecan Pie Squares. My sister and her family and my grandparents will also be there. Then, less than three hours later, we'll be eating another Thanksgiving dinner with my husband's side of the family. The thought of two meals kind of makes me a little queasy, but I'll try to pace myself. HA! HA! If you know me and food, then you know how funny that is. What really matters is that we are able to spend the day with so many loved ones. And Friday... Well it's BLACK FRIDAY and the women in my family do some shopping. We all agree that there is nothing we need, but we love the hustle and bustle of the shopping season. What can I say? It's a tradition! 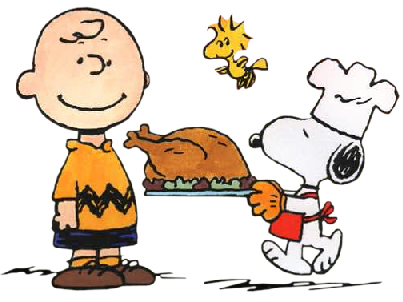 I hope all of you have a wonderful Thanksgiving. Make sure you count your many blessings! Happy holiday -- enjoy that shopping. I used to go to King of Prussia with my sister-in-law. Utterly insane but we'd get all the shopping done in one day. Happy Thanksgiving. Black Friday makes me queasy! I'm not much for all those crazy crowds pushing each other around. I'd rather shop Small Business Saturday and in the normal hours of the day. Have a wonderful day as well! Happy Thanksgiving! Julie, I wish you and your family a blessed Thanksgiving. And, may the force be with you tomorrow as you face the first crowds of the shopping season. If we would be in Orlando, my mom and I would certainly be out on Black Friday (even though it really gets on my last nerve). Mom has a handicapped sticker though, so that is a bonus! Good luck on the pacing. I'm full in 10 minutes after I gorge on mashed potatoes.